This power-packed supplement helps fight demodectic mange by boosting your dog’s immune system functions and improving overall health. 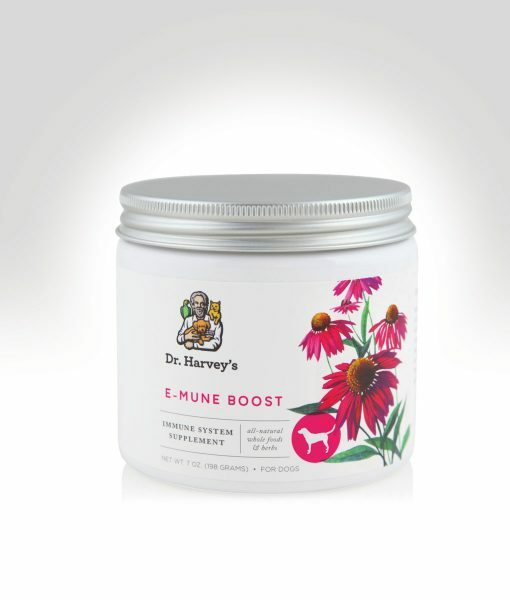 E-mune Boost is rich, food-based immune booster loaded with powerful herbs known to help boost your dog’s immune function. These specifically selected herbs are blended with whole foods choseen for their vitamins and minerals to help enhance your dog’s ability to fight disease. An assortment of wild-crafted and organic herbs is blended in a base of whole foods. That translates into an extra dose of amino acids, vitamins, minerals, and herbs focused specifically on kicking your dog’s immune health up a notch. This hard-to-find formula is great for dogs that have weakened immune systems, yeast issues, poor digestive health and excess toxins due to mange. Enhance your dog’s ability to fight disease — just sprinkle it over your pet’s food. E-mune Boost contains 23 super-charged ingredients.